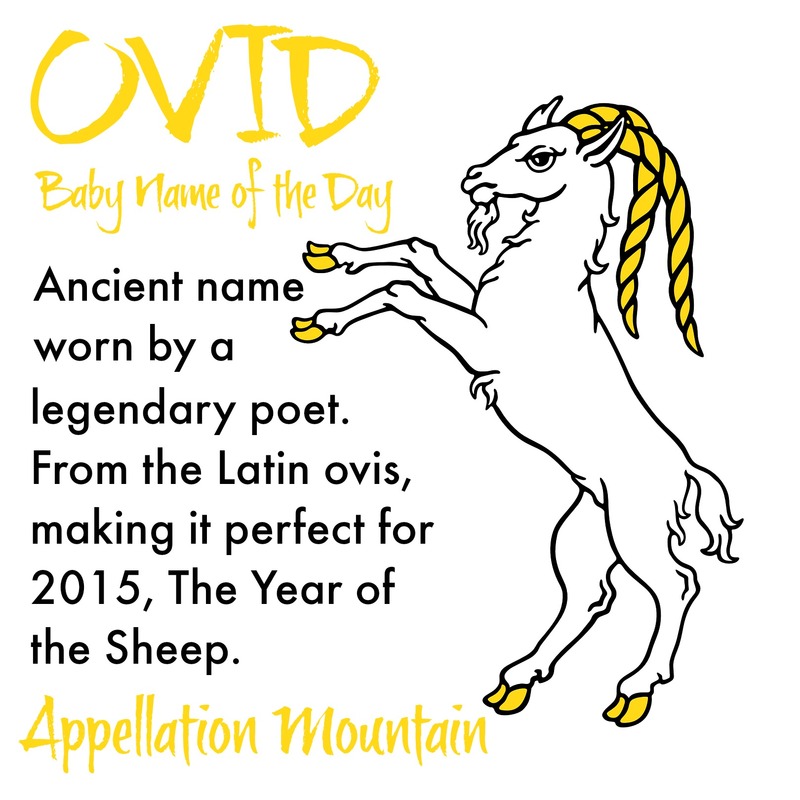 Today’s choice is the name of a legendary poet – and a fitting name for the Year of the Sheep. Wishing you a happy Lunar New Year, with a warm thanks to the amazing Isadora of Bewitching Names and Curious Ideas for the suggestion. 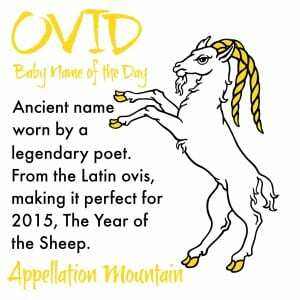 Our Baby Name of the Day is Ovid. Like so many names, Ovid comes to us from a Roman family name. Ovidius is from the Latin ovis – sheep. Thanks to a serious game of whisper-down-the-alley, ovis is also the source of ewe, a female sheep. Sheep are meek and mindless followers – a negative. But they’re also peaceful, the Christian flock led by Christ as shepherd, an image that is overwhelmingly positive. And they’re considered an auspicious symbol in the Chinese zodiac, heralding a year of property. In ancient Rome, a sheep was a go-to animal for ritual sacrifice. 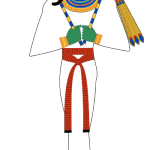 Haruspicy was the art of examining the sacrificed sheep’s liver to tell the future. Most will think not of sheep, but of Publius Ovidius Naso, a Roman poet who was born around 43 BC and died around 17 AD. It’s pronounced like David, with a long Oh sound instead of Day. Except I’ve met an Ovid who pronounced his name oh VEED – and I’ll admit I liked that sound better, even if it confused me! Ovid’s Metamorphoses is his masterwork, covering the creation of the world through the reign of Julius Caesar. It’s a catalog of myth and legend, widely read by other literary giants, including Shakespeare. He also wrote extensively about love, and probably wrote plays – though little remains of those works. Other literary appellations from the ancient world, like Virgil and Horace, have had their moments, while Ovid remains in the shadows. 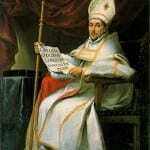 There’s a Saint Ovidius, a Roman citizen who became Bishop of Braga – that’s modern-day Portugal – in the year 95. He died a martyr in 135. Here’s a quirky thing: his name is also recorded as Ovidio, Ouvido, and Auditus. Those last two spellings refer to hearing, and the saint was said to cure hearing loss. His final resting place in Braga Cathedral was once a destination for pilgrims hoping to cure various auditory ailments. Even though this name is rarely heard in English, Ovidiu has been big in Romania in recent years. 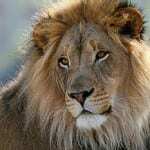 There’s also Ovidio, favored in Italian, Spanish, and Portuguese. With our affection for ‘o’ ending boy names like Lorenzo and Matteo, Ovidio seems like it could have potential. In fact, Ovidio has been far more popular than just Ovid over the last century. Ovid is about as rare as they come. The last year the name was given to as many as five boys was 1985. The year before that? 1973. That means that, in forty-odd years, there were somewhere between ten and 162 newborns Ovids in the US. Ovidio has fared far better, seeing consistent – though limited – use. There were seven newborn Ovidios in 2013, and 15 back in 2003. All of this makes Ovid a true rarity. 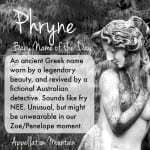 If you’re after a name that seems intellectual, but not as dusty as Horace or as complicated as Ptolemy, Ovid could be one to consider. What do you think of Ovid? Is it wearable for a child in 2015? My immediate association was: “Wasn’t there some kind of book or cartoon character named Ovid? Maybe a duck?” So I googled it and I must have been thinking of “Ovide and the Gang” which was popular in the last 80s in the UK. Not sure what’s with the extra “e” on the end though. Since I think it was pronounced the same. 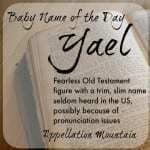 I do like the letter O a lot and this is definitely an undiscovered name with a legitimate and positive history. Plus the similarity to David should make it feel familiar. Possibly an option if Oliver is too popular for you.